This year, Orange will offer modern bassists the new OB1 series of amp heads that will be unveiled at NAMM 2015. Radial Engineering announces an upgraded version of its Bassbone bass and double bass preamp pedal, which will be showcased at NAMM 2015. TC Electronic launches this month two new BH portable bass amp heads, the BH550 and BH800. The mini amps for headphones and guitar/bass from Vox are now available in a new enhanced version. The new Hartke HD bass combo amplifiers with HyDrive hybrid speakers are coming to your authorized dealer. 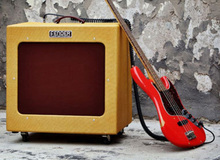 TC Electronic offers bass players Combined TonePrints for all its compatible bass amps. TC Electronic has hidden Easter Eggs on its website, if you find them, you could win gifts! Gallien Krueger completes its catalog with the new CX Series, which features three bass cabinets. Hong-Kong-based Hotone Audio completes its Nano Legacy series with two amps and a cabinet for bass and guitar. Three years after the last update, Ampeg renews its BA bass amp series and introduces at Musikmesse 2014 five models.